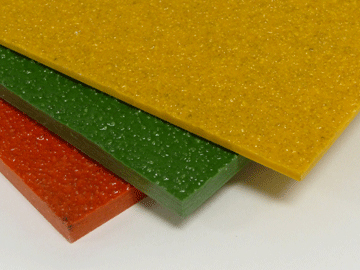 In caustic and/or acidic conditions, Fiberplate molded floor plate provides a level of corrosion resistance that is unequaled, even with stainless steel. In addition, the strength of Fiberplate is evident by its ability to support heavy loads. Vi-Corr : A superior vinyl ester resin available only from Fibergrate, Vi-Corr was developed for reliable performance in the toughest environments. It offers outstanding resistance to a wide range of highly corrosive situations, ranging from caustic to acidic. IFR : This isophthalic polyester resin formulation is designed for industrial and chemical processing applications where corrosion resistance is important. FGI : This food grade isophthalic polyester resin system is designed to meet the unique requirements of the food and beverage industry. Corvex : An economy polyester grating, Corvex outperforms a number of competitive fiberglass and metal products and meets the requirements for corrosion resistance found in light industrial and water/wastewater applications. XFR : This corrosion resistant vinyl ester resin was specially designed for extra fire retardancy and combines high operating temperatures with low flame spread. Super Vi-Corr : A superior grade vinyl ester resin system designed for extreme operating temperatures (180 to 400 degrees F) and extremely corrosive environments. ELS : This modified acrylic resin system is designed for low smoke generation.